The Mexico Beach Community Development Council would like to thank you for visiting our website (and hopefully our white-sand shores!). We are here to answer any questions you may have about our little slice of paradise on the Gulf of Mexico. Our goal is to help visitors and locals alike learn more about our area and make great memories on what we like to call The Unforgettable Coast®. The Mexico Beach CDC is dedicated to helping make Mexico Beach a great place for visitors and residents by promoting tourism and positive experiences in Mexico Beach. The CDC is funded by tourism bed-tax collected in the Mexico Beach taxing district. The board of directors is comprised of nine members appointed by the Bay County Board of County Commissioners. Three of the members are collectors of the tourist development tax, two members represent the tourist-related businesses in the area, two members represent Mexico Beach residents, and two members are elected officials. The board meets once per month, on the third Thursday of the month, unless otherwise stated. 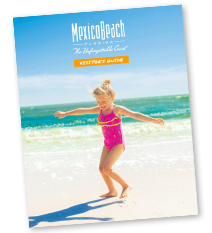 Click here to view the Mexico Beach Community Development Council marketing resources. The Tourist Development Tax (commonly referred to as the “bed tax”) funds the marketing and promotional activities performed by the Mexico Beach Community Development Council. The tax also is used for beach cleaning and grooming, product improvement, and beach nourishment. To find out more information on the Tourist Development Tax, contact the Clerk of Court’s office at 850-747-5226. Click here to go to the Bay County Clerk of Court’s website. Contact the Mexico Beach Community Development Council by visiting the Welcome Center, located at 102 Canal Parkway, Mexico Beach, FL 32456; by calling (850) 648-8196; or by e-mailing info@mexicobeach.com. You may also use the contact form here.